The Congress theme is: Environmental Education in Cities and Rural Areas: Seeking Greater Harmony. Proposals may be submitted in Arabic, English, French, and Spanish. The presentation formats to choose from are: Oral Papers, Poster Presentations, Round Table Papers, and Workshops. Detailed instructions for submitting your proposal are available at this site. Again, please encourage friends and colleagues to submit their own abstracts.Your proposal must be submitted online. 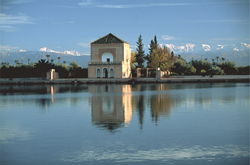 We look forward to seeing you in Marrakech!